On average, a person spends one-third of their life asleep. Sleep is a good break from everyday life, but it’s surprising how much a one’s personality affects the way they sleep. We surveyed 1,000 Americans and asked them how they get their best sleep. Whether it’s cuddling close with a partner, stretched out on their back, or curled up in a ball, we wanted to see how personality types influence rest. Most of our survey participants sleep like a baby – in the fetal position. With over 26 percent of participants choosing the fetal position, it’s the most popular sleeping position. Following the fetal position, nearly 22 percent of participants prefer to fall asleep on their stomach with their legs outstretched, gently cradling a pillow. The top five sleeping positions are a pretty fair mix of sleeping on one’s side, stomach, or back. 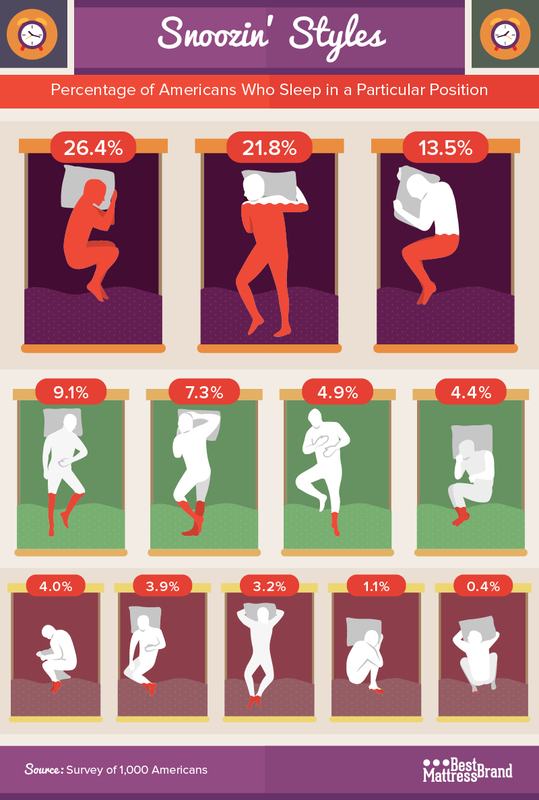 These five sleeping positions account for 78 percent of our survey participants. Your body language says a lot about you, even when you’re sleeping. According to survey results, a majority of introverts prefer tighter sleeping positions, such as the fetal position. Similarly, sleeping on your side, with arms hugging a pillow and knees together, received similar results. For both positions, over 63 percent of respondents who preferred that position were introverted. Of the participants who chose the fetal position, 38 percent were introverted thinkers, and nearly 26 percent were introverted feelers. Most of the extroverts we surveyed preferred to sleep on their stomachs. Over 30 percent of extroverts either preferred sleeping on their stomach hugging a pillow with their knees bent, or with their arms over a pillow and their legs crossed. Of the participants who chose to sleep on their stomach while hugging a pillow with their knees bent, 21 percent were extroverted thinkers and nearly 9 percent were extroverted feelers. In addition, of the participants who prefer to sleep on their stomach with their arms over their pillow and their legs crossed, over 19 percent were extroverted thinkers and 11 percent were extroverted feelers. According to The Myers & Briggs Foundation, feelers tend to be more compassionate and warm, which could explain why feelers prefer tighter sleeping positions, including the fetal position and sleeping on one side while hugging a pillow with knees together. In addition, feelers want harmony. Of the top five positions, those two are the most symmetrical. Of the top five sleeping positions, the greatest number of feelers preferred sleeping in the fetal position (31 percent). More thinkers preferred sleeping on their stomach or back, as opposed to feelers who prefer sleeping on their side. The fetal position is definitely in the top spot, with over 20 percent of each personality type choosing this position as their go-to. Nearly 28 percent of introverts preferred the fetal position, followed by 25 percent of extroverts and just over 21 percent of equally introverted and extroverted participants. A higher percentage of introverts than extroverts preferred sleeping on their stomach with their arms over a pillow and one knee raised (22 percent).When it came to sleeping on their back or on their stomach with their legs crossed, those who were equally extroverted and introverted made up the majority of the respondents. The fetal position remained the top sleeping position, even between couples. Over 23 percent of both thinkers and feelers said they preferred sleeping in the back-to-back fetal position with their backs close to each other. Feelers and their partners said they tend to sleep in a more intimate position than thinkers. A higher percentage of feelers prefer to sleep in a close spooning position, with one partner’s back to the other’s stomach, while thinkers sleep in a similar position, but further apart from each other. More thinkers preferred to sleep in a back-to-back fetal position and close to their partners (nearly 28 percent), while 21 percent of feelers chose a back-to-back fetal position that was further away from their partners. Over 30 percent of introverts choose to sleep in the fetal position close to their partners, while 22 percent prefer the fetal position but with some distance from their partner. Sleeping this close to your partner could lead to inadequate sleep, especially if one partner is shifting more throughout the night due to finding the mattress uncomfortable. Check out our post on the best mattress for couples, for tips on how to find a mattress that works right for people with different sleep styles. 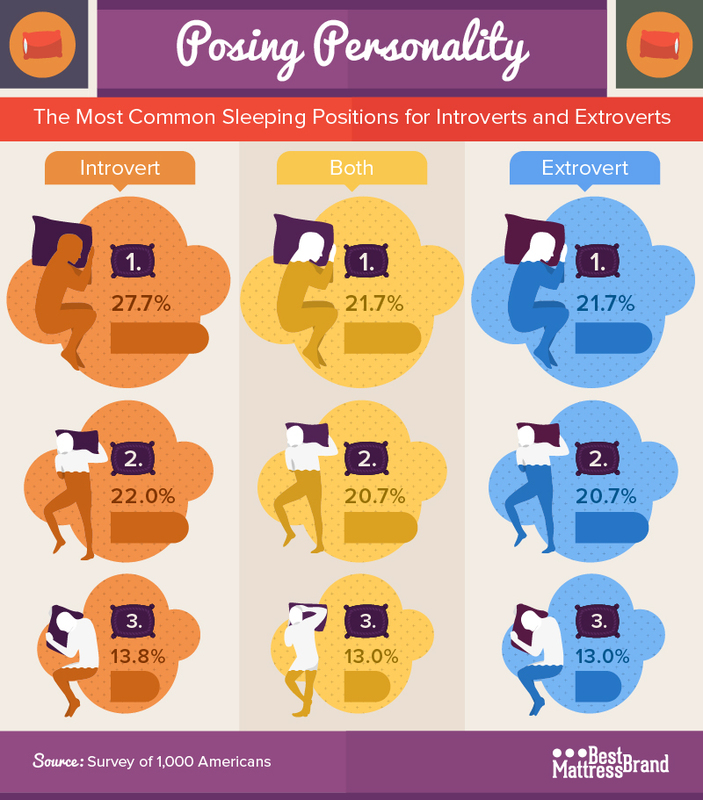 Between sleeping in the fetal position and spooning, both positions ranked similarly among equally introverted and extroverted survey participants. At least 20 percent of participants chose either of these positions. Over 16 percent of extroverts said they preferred spooning with their partner while getting some sleep, while nearly 13 percent preferred spooning with some space apart from their partner. The least popular position among partners was where one partner sprawled on their back with the other on their stomach, with less than 3 percent of introverts and 4 percent of extroverts preferring it. Whether you prefer to sleep in the fetal position or any of the other top sleeping positions, do it on the best mattress available. Whether an introvert or extrovert, a feeler or thinker, find the right mattress and tips to improve your sleep from Best Mattress Brand. We have guides on mattress brands and tips for improving sleep with pain here for you to check out. We surveyed 1,000 Americans and gave them a shortened Myers-Briggs personality test, presenting them with 10 questions to determine if they were an extrovert or Introvert, and 20 questions to determine if they were a thinker or feeler. Respondents were then shown images of sleeping positions and asked to pick the one that best matched their sleeping form.